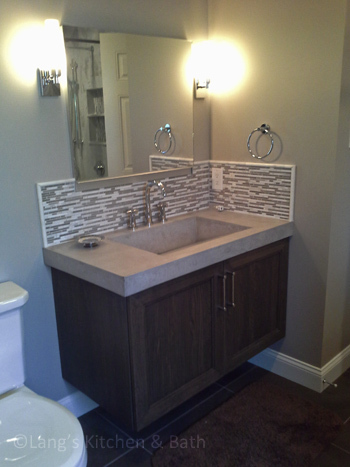 This new bathroom features an Oceania freestanding tub, DuraSupreme weathered vanity, concrete sink, and a Robern medicine cabinet. Get started today with Langs! The Oceania freestanding tub serves as an eye catching focal point in this transitional style bathroom design, and is surrounded by excellent features. The DuraSupreme weathered vanity is topped by a concrete sink and countertop and finished off with a lift-up Robern medicine cabinet. 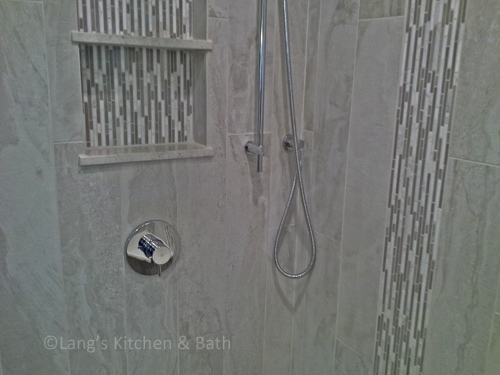 The shower includes a beautiful mosaic tile detail and built-in shelf for handy storage, along with a Dreamline shower door. The bathroom design is finished off with Warmly Yours underfloor heating to ensure you are comfortable from the moment you step foot into the room.